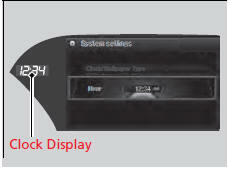 The clock is automatically updated through the navigation*/audio system, so the time does not need to be adjusted. You can also adjust the time manually in the audio/information screen, with the power mode in ON. - Repeat the procedure to select Clock, then Clock Adjustment. 3. Rotate to change hour, then press . 4. Rotate to change minute, then press . You can turn the clock display in the audio/ information screen on and off.